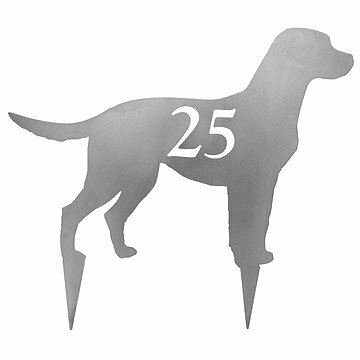 Proudly display your canine dedication with these customizable lawn silhouettes. For such loyal pets, dogs sure seem to rule our lives. We feed them and groom them. We twist our schedules to accommodate their feeding and walking. But for a true dog lover, being "in the dog house" is the highest praise. Proudly display your canine dedication with these customizable lawn silhouettes. Available in a variety of breeds, each is cut from 16 gauge steel custom cut with your street numbers. The metal finish and clean lines of the design add a handsome, contemporary touch to any exterior, while the instantly recognizable dog outline brings a personalized touch of warmth. Sizes vary slightly according to breed of dog. Handcut in Old Saybrook, Connecticut. Click here to see all the dog silhouettes. This item will develop rusty patina quickly if left to oxidize naturally. To help retain the existing finish, apply a clear, exterior-grade, polyurethane sealant once a year. This is a gift so I don't know where they will put it...yet. Can be customized to a specific dog breed. In this case my friend has a Shiba Inu that tends to run off. Perfect way to show that the dog lives there. Bought as a gift, can't wait to get one for myself! Bought this as a going away gift for owners of our dog daycare. We are in the process of moving and are looking forward to getting one for ourselves as soon as we buy a new house! We bought one as a housewarming gift (dachshund) and one for ourselves (GSP), and are very happy with the quality and size. We plan to let ours patina in the weather. The whole neighborhood loves it! As additional address marker-illuminated at night with solar spotlight. Sprayed with clear coat to maintain weimeraner's gray-ghost look. What a great original gift!